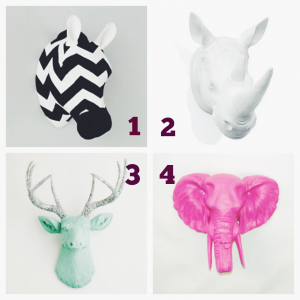 I love decorating and nothing excites me more than adding animal heads in the mix. Not to be confused with a “lovely room of death”(watch Ace Ventura)…but rather an homage to God’s beautiful creatures. I love the whimsy they add to any room from bedroom to bathroom to living room. Some of my favorites are listed above. I just found out about the White Faux Taxidermy site and I am loving all the options. You can get so many different animals in so many different colors. They are so cool. They are similarly priced as a nice picture but I think the impact is way bigger. 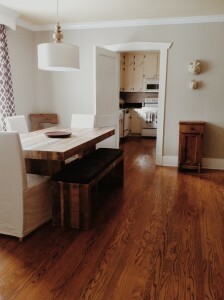 Here is how I used some pig heads in my dining room! I was hoping to send subliminal messages to eat less…hrmmm!